The Denver Nuggets have reached an agreement in principle to acquire former MVP Allen Iverson from the Philadelphia 76ers, according to NBA sources. Denver would send Andre Miller, Joe Smith and two 2007 first-round picks to the 76ers for the high-scoring Iverson, and perhaps another minimum-salaried player, an ESPN report citing NBA front-office staff said on Tuesday. Two weeks ago the 31-year-old Iverson demanded the 76ers trade him and Sixers chairman Ed Snider said he would comply with the request. The team cleared out Iverson's locker and have refused to play him. Philadelphia has lost 11 straight and has a 5-18 record -- the worst in the Eastern Conference. Miller, the NBA assists leader in 2002 when he was with Cleveland, is averaging 13 points and 9.1 assists this season while Smith, an 11-year veteran, is scoring 5.1 points per game. 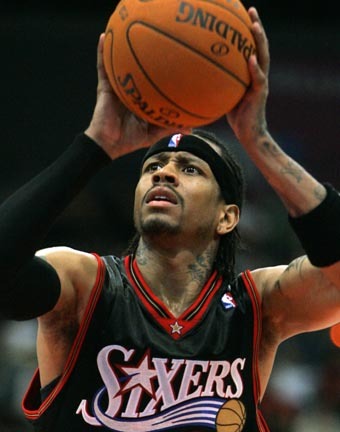 Iverson, is averaging 31.2 points in 15 games this season and has a 28.1 career scoring average in 10 NBA campaigns. He has led the NBA in scoring four times, most recently in 2005, and was the league's MVP in 2001. The NBA's top scorer this season, Denver's Carmelo Anthony, was suspended on Monday for 15 games after his role in the Nuggets' brawl with the New York Knicks on Saturday night. Anthony is averaging 31.6 points this season for the Nuggets, who are second in the Northwest Division with a 14-9 record, and will need Iverson's scoring to keep pace with front-running Utah. The trade will be completed pending league approval, ESPN said.